If you've watched "Cat goes in toilet" more than 200 times,Viacom's lawyers will now know! What is this? Privacy Invasion? or just Embarassing! As part of its $1 billion lawsuit against user-video site YouTube, Viacom will receive a complete log of all users’ activities, which will include a list of usernames, IP addresses, and videos that each account has viewed in the past. Viacom says it wants to use the data to prove that copyright-infringing videos draw higher amounts of traffic than user-generated and fully-legal content. If Viacom’s hypothesis turns out to be true, it could increase penalties against YouTube if found liable for contributory copyright infringement. 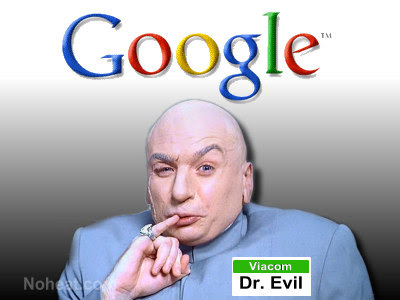 The court order to turn over site logs came as part of a sweeping request by Viacom, where it attempted to acquire source code for the site’s search engine and copyright video filter – which YouTube wrote as the result of previous litigation with copyright holders – as well as copies of YouTube parent Google’s advertisement database schema, and copies of all videos on the site marked “private.” U.S. District Judge Louis Stanton, who is presiding over the case in New York, struck down Viacom’s other requests. YouTube will, however, also have to produce information on how private videos are viewed, including information on who watched them and how many times. Google argued that revealing site logs – 12 terabytes in total and the sole source of information for video view counts – would constitute a massive breach of user privacy and place an undue burden on the company, who would need to vet the data for relevant information. Stanton called these claims “speculative,” and in denying them noted that site logs could be copied onto a handful of “over-the-shelf four-terabyte hard drives.” He agreed with Google, however, in their claims that turning over copies of site’s search engine source code, the “product of over a thousand person-years of work,” noting that such an order could do “catastrophic competitive harm” to the company. CNet notes that Viacom v. Google is about more than a copyright complaint -- with Google’s frequent invocation of the DMCA’s safe harbor defense, one of the most lauded, fundamental rules of the oft-maligned Digital Millennium Copyright Act may be at stake. The Electronic Frontier Foundation argues that, under federal law, courts may not request personally identifiable information unless it is absolutely necessary – which may be beyond the bounds of Viacom’s investigation. Either way, the requestor is obligated to notify consumers beforehand, and allow them a chance to contest the claim. “Today’s court order made no finding that Viacom could not be accommodated by any other means, nor were the YouTube users provided with notice and an opportunity to contest the claim,” said the EFF. Instead, it writes, Stanton referred to a Google blog entry, where the company says that it believes IP addresses cannot identify users, and used Google’s own logic against it. Viacom originally launched its lawsuit in 2007, where it alleged that YouTube users viewed over 160,000 unauthorized clips of Viacom property. The company believes that YouTube’s business model is “based on building traffic and selling advertising off of unlicensed content,” and it demanded a court injunction to stop it.